Sweden’s Sandvik Group created the all-metal, 3D-printed indestructible axe. 'Blue Lightning' is due out March 29. ‘Blue Lightning’ is out March 29. "I love to have fun, except I do it a little differently than most people.” Steve Vai dishes on his idea of a good time: tearing it up with four fellow axe wizards on the 'Generation Axe' tour. 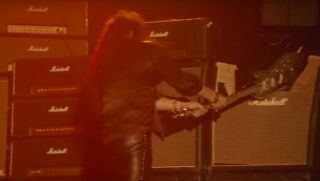 Watch Generation Axe—Vai, Yngwie, Zakk, Nuno and Tosin—Play Deep Purple's "Burn"
Yngwie Malmsteen sang lead on the quintet's ferocious version of the classic Deep Purple tune. Vai, Yngwie, Zakk, Nuno and Tosin Play Deep Purple's "Highway Star"
Vai, Yngwie, Zakk, Nuno and Tosin play a classic.